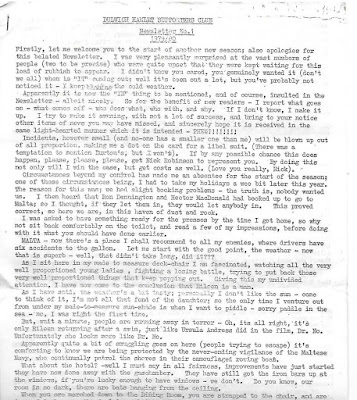 A bit of an odd one ...does anyone know who wrote this Dulwich Hamlet Supporters’ Club newsletter from the beginning of the 1979/80 football season? And are there any more issues knocking around? This particular one (pictured) is made up of two and a half pages of ‘news’ printed on two sheets of foolscap paper, stapled together. Unfortunately we only have part of the first page, but it gives a fascinating glimpse of ‘fanzine style’ material from the nineteen seventies.Presumably the real Hamlet related content is on the other pages. 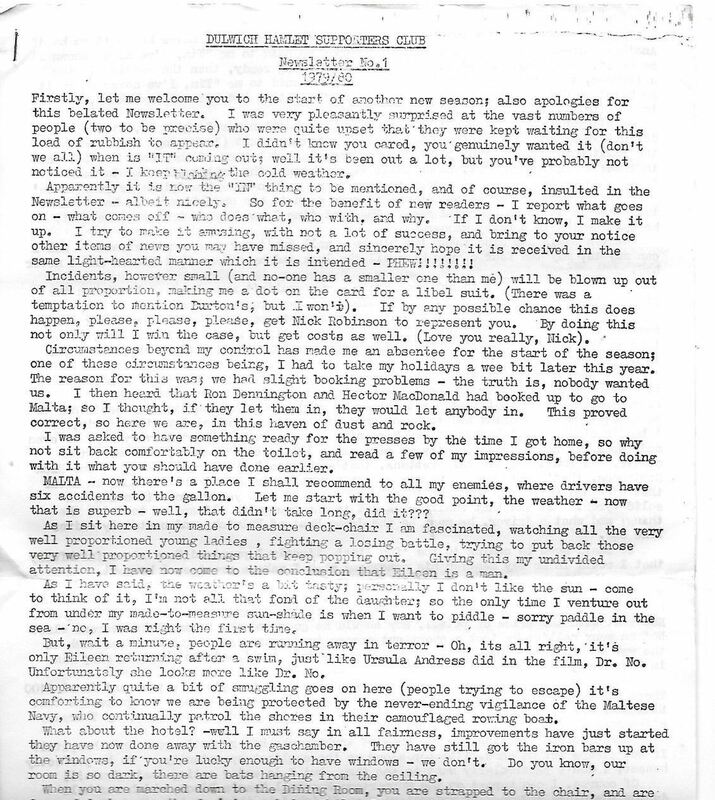 Firstly, let me welcome-you to the start of another new season; also apologies for this belated Newsletter. I was very pleasantly surprised at the vast numbers of people (two to be precise) who were quite upset that they were kept waiting for this load of rubbish to appear, I didn't know you cared, you genuinely wanted it (don't we all) when is “IT” coming out; well it's been out a lot, but you've probably not noticed it - I keep blaming the cold weather. Apparently it is now the “IN” thing to be mentioned, and of course, insulted in the Newsletter – albeit nicely. So for the benefit of new readers – I report what goes on – what comes off and who does what, who with, and why. If I don't know, I make it up. I try to rake it amusing, with not a lot of success, and bring to your notice other items of news you may have missed, and sincerely hope it is received in the same light-hearted manner which it is intended – PHEW!!!!!!!! Incidents, however small (and no-one has a smaller one than me) will be blown up out of all proportion, making me a dot on the card for a libel suit. (There was a temptation to mention Burtons but I won’t). If by any possible chance this does happen, please, please, please, get Nick Robinson to represent you. By doing this not only will I win the case, but get costs as well. (Love you really, Nick). Circumstances beyond my control has made me an absentee for the start of the season; one of these circumstances being, I had to take my holidays a wee bit later this year. The reason for this was; we had slight booking problems – the truth is, nobody wanted us. I then heard that Ron Dennington and Hector MacDonald had booked up to go to Malta; so I thought, if they let them in, they would let anybody in. This proved correct, so here we are, in this haven of dust and rock. I was asked to have something ready for the presses by the time I got home, so why not sit back comfortably on the toilet, and read a few of my impressions, before doing with it what you should have done earlier. MALTA – now there's a place I shall recommend to all my enemies, where drivers have six accidents to the gallon. Let me start with the good point, the weather – now that is superb – well, that didn't take long, did it??? As I sit here in my made to measure deck-chair I am fascinated, watching all the very well proportioned young ladies, fighting a losing battle, trying to put back those very well-proportioned things that keep popping out. Giving this my undivided attention, I have now come to the conclusion that Eileen is a man. As I have said, the weather's a bit tasty; I personally I don't like the Sun – come to think of it, I'm not all that fond of the daughter; so the only time I venture out from under my made-to-measure sun-shade is when I want to piddle – sorry paddle in the sea – no, I was right the first time. But, wait a minute, people are running away in terror – Oh, it’s all right, it’s only Eileen returning after a swim, just like Ursula Andress did in the film Dr. No. Unfortunately she looks more like Dr. No. On Tuesday evening, Dulwich Hamlet put on an extraordinary performance to defeat Braintree Town 5-2 in the FA Trophy third round replay. The result, against a team two divisions higher, puts the Hamlet through to the last eight of the competition and a home match against Macclesfield Town, also of the National League. Braintree Town have had a number of incarnations since their foundation as the Crittall Window Company factory team in 1898. As Crittall Athletic they actually visited the old Champion Hill ground during the 1937/38 season. See Paul Griffin’s notes about that game here. 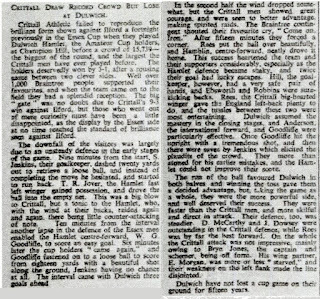 On that occasion – the second round of the FA Amateur Cup – the cupholders Dulwich Hamlet were victors by 3 goals to 1. Despite being dismissed from the premier ‘non-league’ cup competition the visitors went away remarkably happy, due to their great experience at Champion Hill. 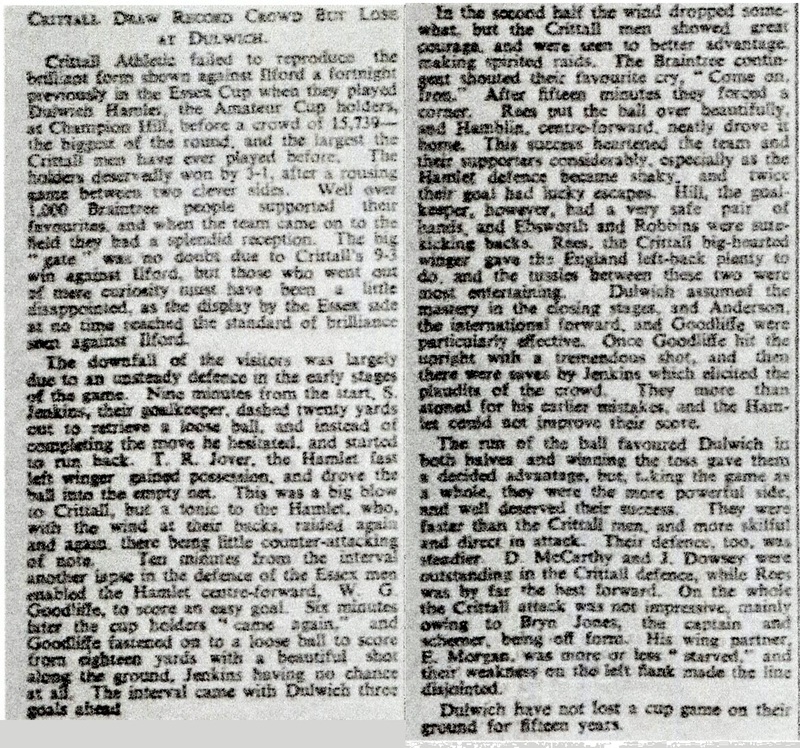 "Our departure from the Amateur Cup at the feet of Dulwich Hamlet was a fair result on the play. Three weeks ago we referred to Dulwich Hamlet as the Arsenal of Amateur football. This generality was evolved more from the fame of Dulwich Hamlet than from a practical knowledge of them. 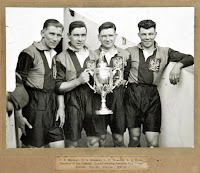 To us they were a name to be treated with every respect, and as a club were generally recognised to be adversaries fit for any amateur club challenge, and worthy foes for a large percentage of our professional brethren. We now possess practical association with them and cannot say enough of the pleasant recollections of our visit to Champion Hill. We readily acknowledge defeat by a better side. Everything was done to make us especially comfortable. There was a refreshing absence of artificiality and an abundance of the real spirit of amateurism. Sceptics may think Dulwich can afford to do things well. Perhaps they can. Good manners, honest amateur enthusiasm and hospitality are not assets engendered solely by the possession of wealth. They emanate from those who consider the game paramount to any prize. It was especially good to feel we were doing battle with a club really and definitely amateur. Champion Hill is a genuine amateur 'football oasis'— there are few of these today! The band even entered into the spirit of things by discoursing 'Any Old Iron' and 'I passed by your window.' Dulwich Hamlet went clean through our window, and they did so in a 'Football Raffles' kind of way, or a sort of half-apologetic, 'We hate to beat you, but we have, and we hope you won't mind!’ We wish to express our appreciation of the Dulwich spectators, officials and players. Congratulations are also due to them for their excellent programme, which told spectators everything they could possibly wish to know of ourselves as visitors. We noted the compiler of the programme did not swamp his patrons entirely with sugar ripened by Dulwich partisanship. We have received a cheque for £234 as our share of the gate, which is easily a record with us and will be talked of in local football circles for many a day. Thank you, Dulwich!" Whether Dulwich Hamlet will receive similar praise from the present day successors, Braintree Town, remains to be seen. They are at home tomorrow (Saturday 11 February 2017) to North Ferribly United. Someone please keep an eye on their programme.